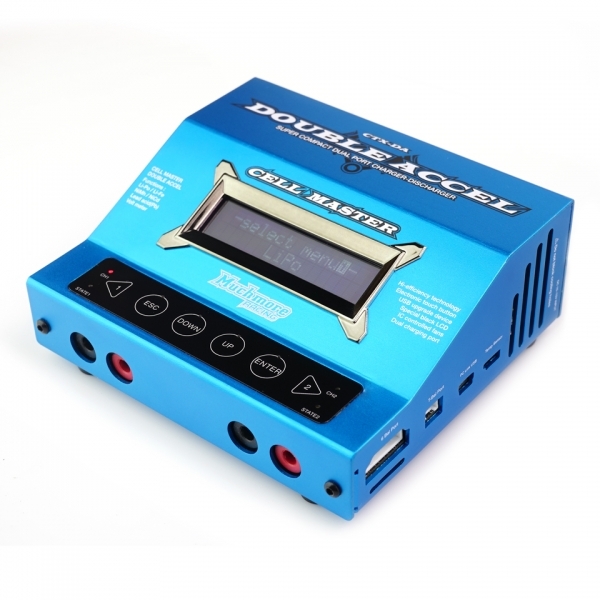 Cell Master Double Accel Charger Blue-Muchmore Racing. Co., Ltd. 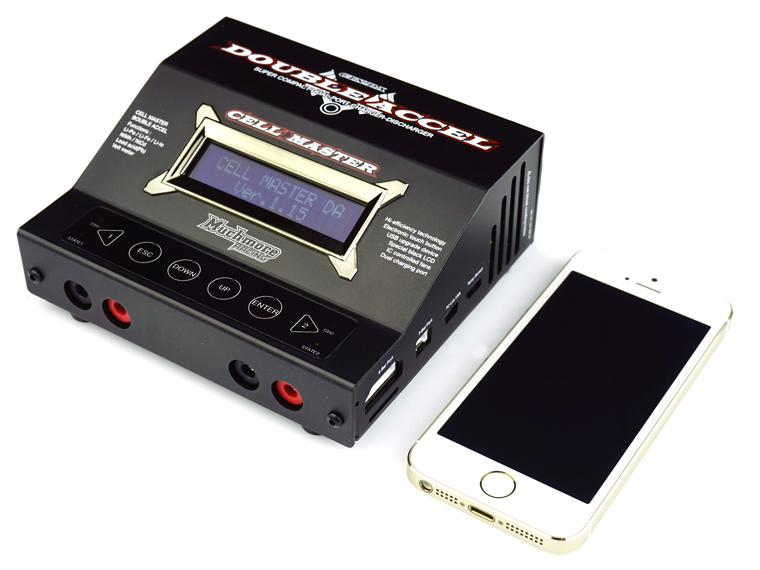 Cell Master Double Accel is the world's smallest 2-port charger/discharger. All the features tested and completed by our Team of R&D, Factory team drivers and ISTC World Champion Marc Rheinard. 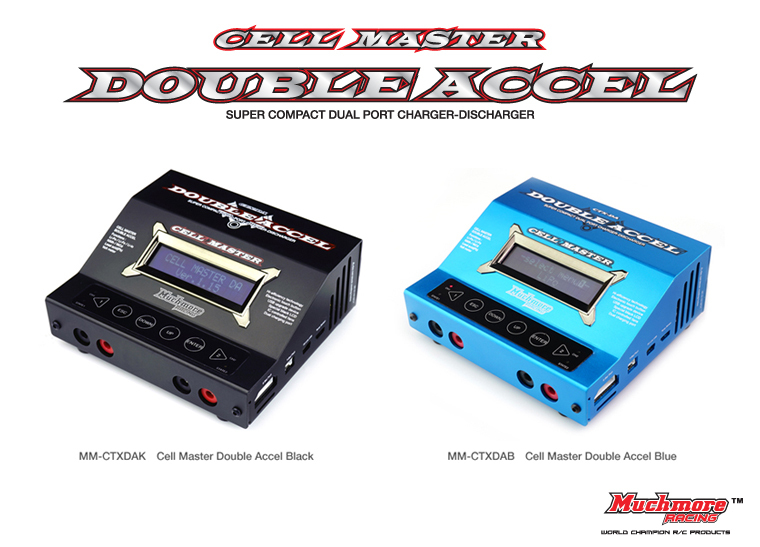 Cell Master Double Accel is designed for expert R/C car drivers it gives a great race time. 2-port 200 watts (100W +100 W) charging circuit. simultaneous charging of two batteries up to each 10 amps. 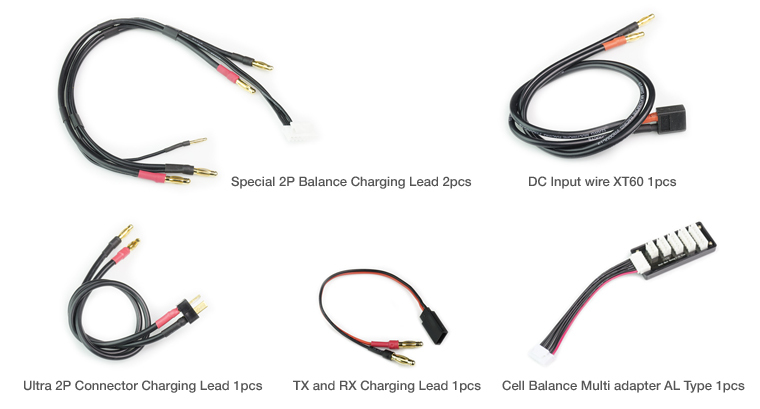 Includes high precision Special 2P Balance Charging Lead, can charge directly without conversion connector. Muchmore Racing R&D Team developed high-efficiency currents boost system. 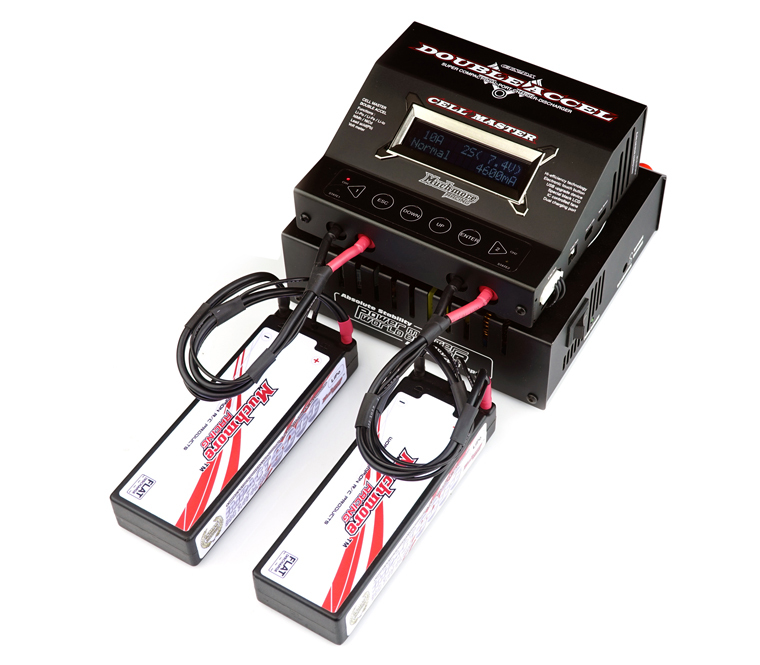 For example, when LiPo 2S 10A charge batteries, currents is only required 8A. Do not need a high-capacity power supply. 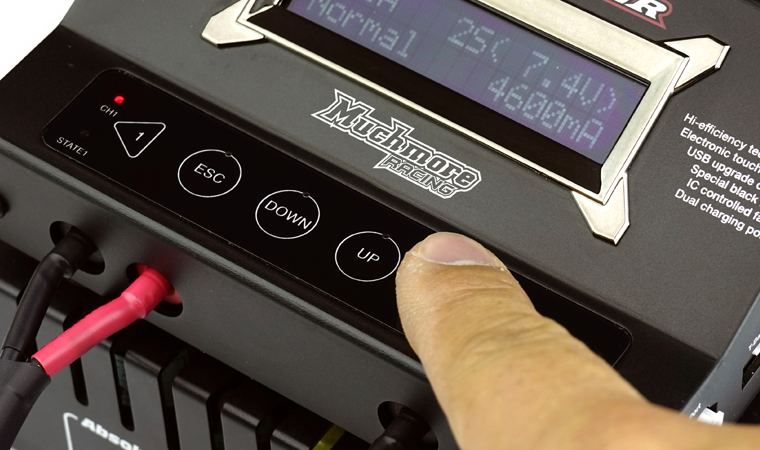 Muchmore Racing R&D team has succeeded to make the world best compact dual-port charger. It is the fine compact charger with high-tech designed balancing circuit, constructed dual charging system. Very stmall size, light weight make easy to move on your pit table, can take full advantage of the space. All this technology is accessible through an easy-to-read Special black back light LCD display. Adopting a very high sensitivity touch button for each menu, you can run briefly. Also prevent the penetration of foreign substances. This system ensures the stable operation of the button on dusty environments such as off-road stadium. Designed UI to use easily is based plenty race experience. Fast response time will help you to conveniently charge. Easier to check charging status; charging, discharging, stand-by, complete, at a glance by Dual blue state indicator LED. Under any circumstances, you may want to move the channel to the one-touch. Individual cell and total pack volt shows at a glance. You can check the voltage of the battery before a race. so you can check the condition of your Lithium battery packs. The world Tamiya R/C race certified Lithium battery can be charged immediately without conversion connector. 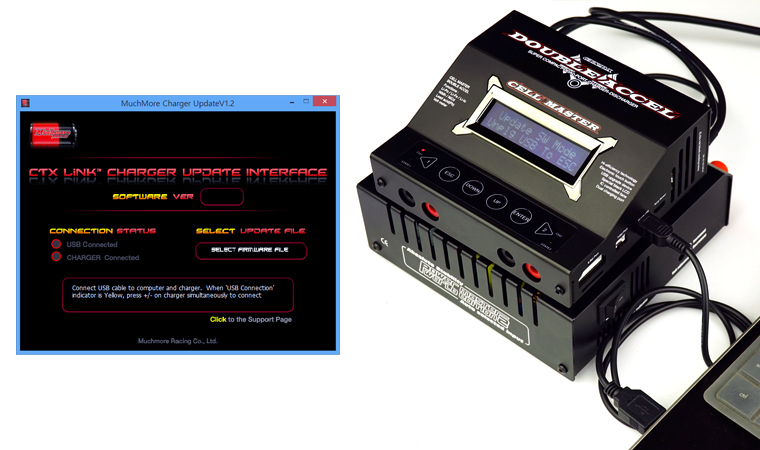 Muchmore Racing CTX Link™ software you can easily upgrade to the latest firmware. The new firmware for the future simply by updating, you can use the latest features without discomfort. When charging NiCd or NiMh, you can set the upper limit of charge current to avoid damage or explosion from high current feeding. If you set the limit of battery temperature the process will be expired forcibly when the limit has reached. Prevent reverse connection of the battery to prevent damage to the equipment and a built-in safety circuit. When you do short-circuits between the output charge lead , LCD screen will let you know. Use Low-noise/high-performance dual cooling fan. Temperature controlled system make the effectual cooling condition.